Railways are a key mode of transportation for both passenger and freight throughout the world. The enormity of its network contributes to significant resource consumption (both energy and water) and generation of waste, which is quite imperative for running and operating such a huge system. This resource consumption can be attributed to two major heads- traction and non-traction. Traction energy is attributed to running the trains while non-traction energy is related to operating the facilities for running the trains and passenger inter-change like railway stations* etc. There exists a huge potential for promoting resource use efficiency in non-traction areas of railway stations. 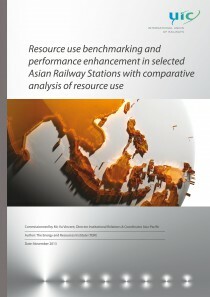 This study focuses on mapping the resource consumption in selected Asian railway station with comparative analysis of resource use, thereby arriving at attainable benchmarks for resource consumption and waste generation for railway stations.